Stink Bug Control | Exterminator | Westchester, NY. 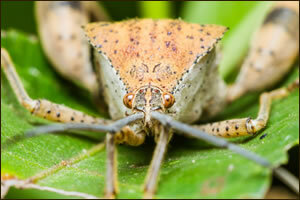 The stink bug is also known as the brown marmorated stink bug. The adult brown Marmorated stink bug is about .75 inches long. Its body is nearly as wide as it is long. They have a shield like shape to their body. It is brown in color. The name “stink bug” comes from the scent glands they have located on the underside of the thorax. Stink bugs are quickly becoming a major issue in Westchester County. Call QualityPro to help you remove this insect from your home. The Stink Bug is a pest that will devour fruits and vegetables. The largest threat in the foreseeable futures is the growth of the stink bug population and the destruction of fruit bearing trees and vegetable crops in Westchester, Rockland, Bronx, Putnam and Greenwich, CT. Warm conditions could generate up to three generations of these pest insects in a year.